The DNR discourages the destruction of aquatic vegetation; however, we recognize that excessive plant growth may interfere with a homeowner's reasonable need to access the water and recreate. What is considered reasonable is subjective. Shoreline property owners or prospective buyers often have unrealistic expectations of transforming the near-shore area from a soft-sediment plant dominated state to a swimming beach. Learn more by downloading our guide for buying and managing shoreland. 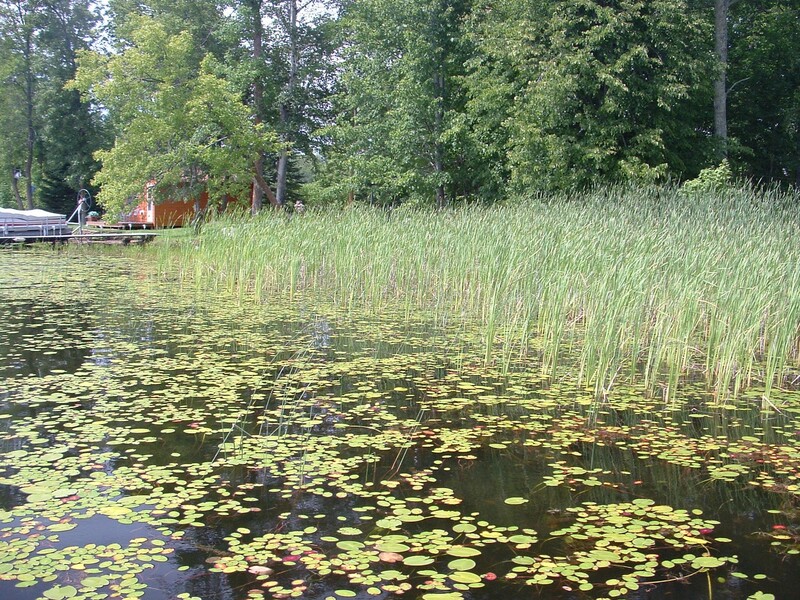 Dense aquatic vegetation is completely natural in certain types or areas of lakes but specific human activities increase plant biomass in a lake. The addition of nutrients such as phosphorus and nitrogen to a lake is the biggest factor promoting nuisance aquatic plant growth. Human activities in the watershed, including urban development and agriculture, increase nutrients. Lakeshore development increases nutrients by removing vegetative buffers, adding fertilizer to lawns and sometimes via leaky septic systems. Weather events can intensify nuisance plant growth. High rainfall events bring surges of nutrients into lakes, often leading to algal blooms. Additionally, low water levels from drought expands shallow-water areas available for additional plant growth. Looking to the future as the climate changes, Minnesota is seeing shorter and milder winters, meaning longer growing seasons for aquatic plants. Minimize or eliminate the use of fertilizer on your lawn. Maintain a vegetative buffer along your shore it not only captures nutrients but reduces erosion. Avoid installing hard, impervious surfaces near the lake. Clean up after your pet. In highly developed areas, pet waste is a major nutrient source. As a shoreland property owner or manager, determine how you can implement a few best practices for shoreline management. Plants are cut or pulled by hand or with equipment such as rakes, cutting blades, hand-operated or motorized trimmers. Large-scale mechanical control often uses floating, motorized harvesting machines that cut the plants and remove them from the water. The plants are taken to shore for proper disposal. All plants that are mechanically controlled must be removed from the lake. Plant-killing chemicals are applied in liquid, granular or pellet form. The aquatic plants die (sometimes only the stems and leaves) and decompose in the lake. Areas treated with aquatic herbicide are posted with signs to inform lake users of any water use restrictions resulting from the application of the pesticide. Only herbicides labeled for aquatic use are allowed, and any use of herbicide for aquatic plant control requires a DNR permit. Using a herbicide without a DNR permit is a misdemeanor and may result in a citation. A permit may be required to control aquatic plants regardless of the method so determine what plants you have and learn what you can do.